Unless specifically noted, this site, its content or the information available on or through it is provided on an "as is" basis without warranties of any kind, either express or implied, including warranties of title or implied warranties of merchantability or fitness for a particular purpose. You acknowledge that you use this site at your own risk, that you assume full responsibility for all costs associated with all necessary servicing or repairs of any equipment you use in connection with your use of this site, and that Mens Tungsten Online and its affiliates and third party service providers shall not be liable for any damages special, indirect or consequential of any kind related to your use of this site. Please note that the above disclaimer does not apply to products you may purchase through this site. Warranties and return rights concerning such products are governed by terms provided elsewhere in this site and by applicable law. If any disputes arise between us regarding your use of this Web site, such disputes shall be resolved according to the laws of the State of Utah. 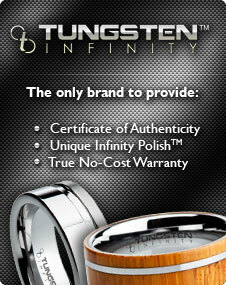 Any message you send to us via e-mail, postcard, letter, voice mail or other transmission relating to your use of this site, other than an actual order of merchandise, shall be and remain Mens Tungsten Online’s property, and Mens Tungsten Online shall not be limited in any way in its use, promotional, commercial or otherwise. However, we will not use your full name in any such promotional use without your permission. You agree that no such messages will violate the rights of any third party or contain any libelous or otherwise unlawful materials. We save certain messages and e-mails on file for promotional and marketing purposes, but we are not required to and do not retain every such message. in conjunction with its third party service providers, operates this Web site.